LVIV, Ukraine -- There is some egg-celent news coming out of Ukraine this week. 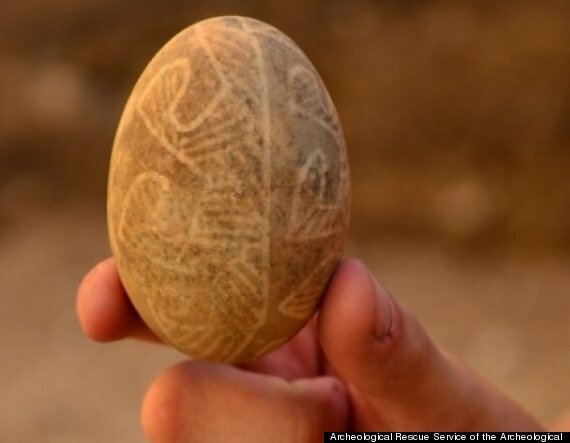 Researchers announced the discovery of an Easter egg that may be five centuries old. According to the country's national wire service Interfax-Ukraine, the egg was discovered in part of a drainage system in the rich historical and cultural city of Lviv, located around 30 miles from the Poland-Ukraine border. A religious nation, more than half of Ukrainians are Orthodox Christians belonging to the Ukrainian Orthodox Church–Kiev Patriarchate. The tradition of decorating Easter eggs is an essential part of Easter celebrations in the country. Ukrainian folk artists have perfected the ornate artwork of the traditional "pysanka," elaborately decorated Ukrainian eggs, for over hundreds of years. "Easter would not be Easter without the eggs," Hanya Krill, Program Director of the Ukrainian Museum in New York City, told The Huffington Post. The ancient egg discovered on Shevska Street in Lviv is probably a goose's egg, according to the Rescue Archaeological Service of the Institute of Archaeology of the National Academy of Sciences of Ukraine. Researchers from the institute believe theirs is the oldest egg found in the region so far. Junior Rescue Archaeological Service research officer Ostap Lazurko said that while a few ceramic eggs from the region have predated the latest find, no natural eggs as old as this one have been unearthed. "This one is made on an egg shell, most likely from a goose egg," Lazurko said, according to media reports. "And it is very well preserved, almost 90 percent." Often created as gifts for friends or neighbors, every aspect of a pysanka has meaning, Krill told HuffPost. The colors of the egg can indicate the age of the owner -- bright colors for younger members of the community, darker colors for elders. "They are also steeped in symbolism," Krill told HuffPost. "There are symbols that represent the sun, that represent the stars. Eternity is represented by curving lines or lines the encircle the egg. While certain animals, for example deer, represent wealth." If you give an egg with a deer design on it to your neighbor, this means you wish them wealth, Krill explained.